Holy water (Theertham) : Brahmma, Parasurama Theertham. Sacred Tree (Sthala Vriksham) : Banyan Tree. Timings : 06:00 a.m. to 12:00 noon and from 04:30 p.m. to 08:30 p.m. This is the 55th sthalam on the northern side of river Cauvery. Moovar has sung hymns in praise of Lord Shiva of this temple. 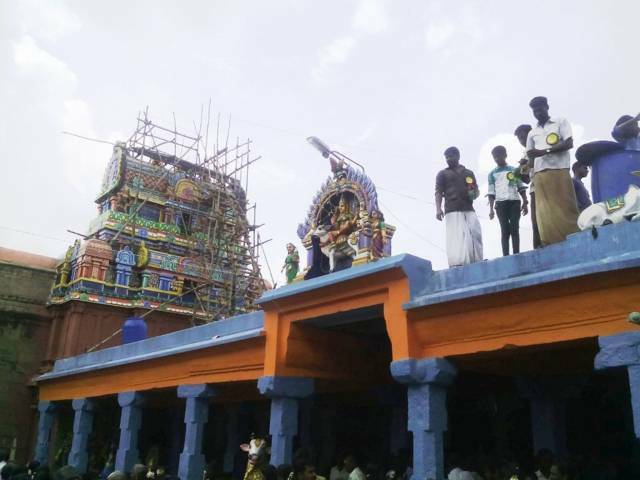 Sri Alandurayar (Vadamoolanathar) temple is located in the village named Kilapazhuvur, in the district of Ariyalur, in the state of Tamil Nadu in South India. 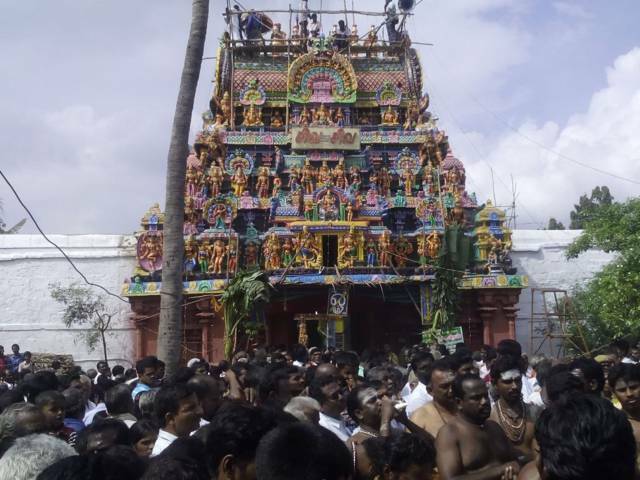 The primary deity of this temple is Alandurayar (Vadamoolanathar) (Lord Shiva) and his consort is Arundavanayaki. The place is now called as Keezhapazhuvur. The holy tree of this temple is Banyan tree. 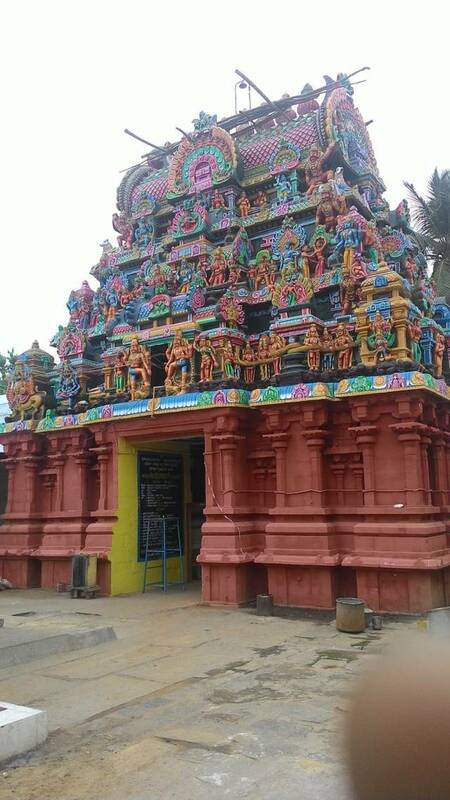 The holy water of this temple is Brahmma and Parasurama theertham. 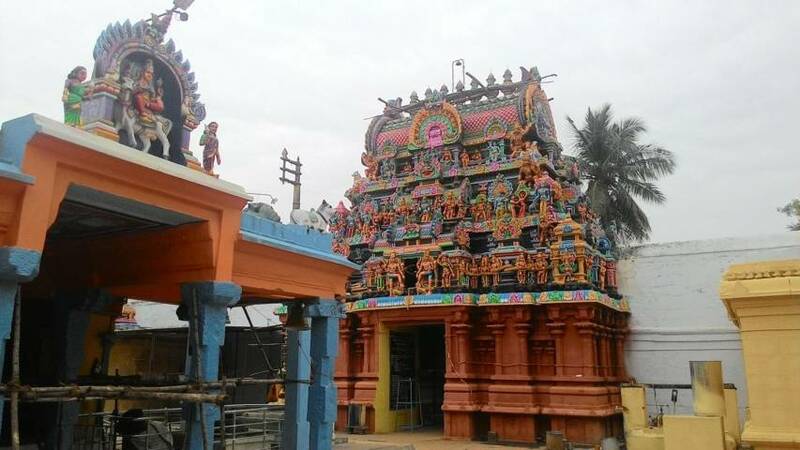 The agamam or pooja of this temple is known as Sivagama. This temple is nearly 1000-2000 years old in this region. 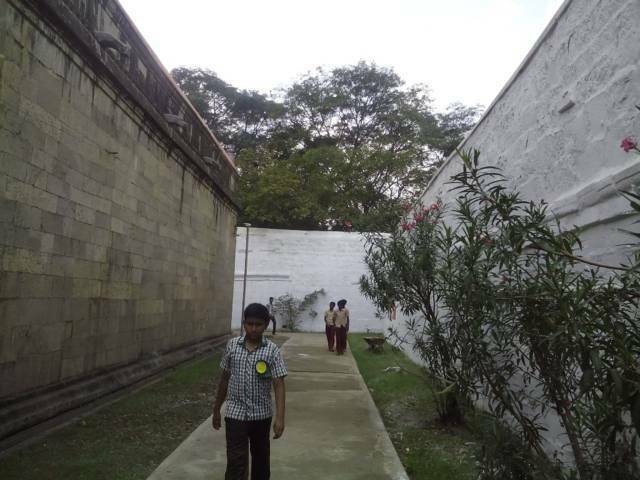 The historical name of this place is Thirupaluvur. A separate idol of Ambal doing thapas on single leg for the benefit of world’s peace can be seen here. 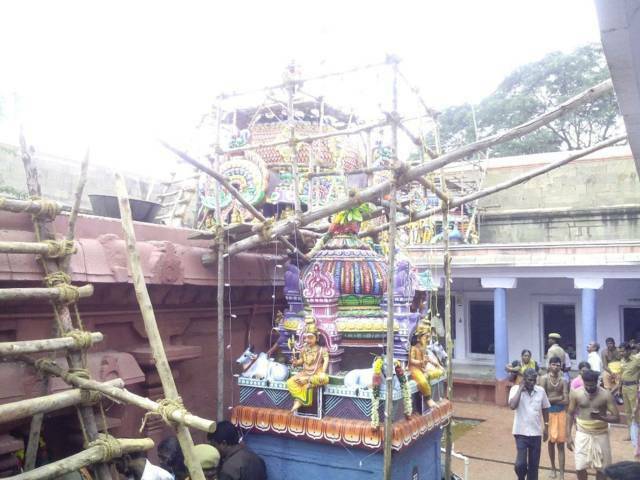 For the Kayamugasuran’s samharam Vinayagar danced as Narthana Vinayagar. 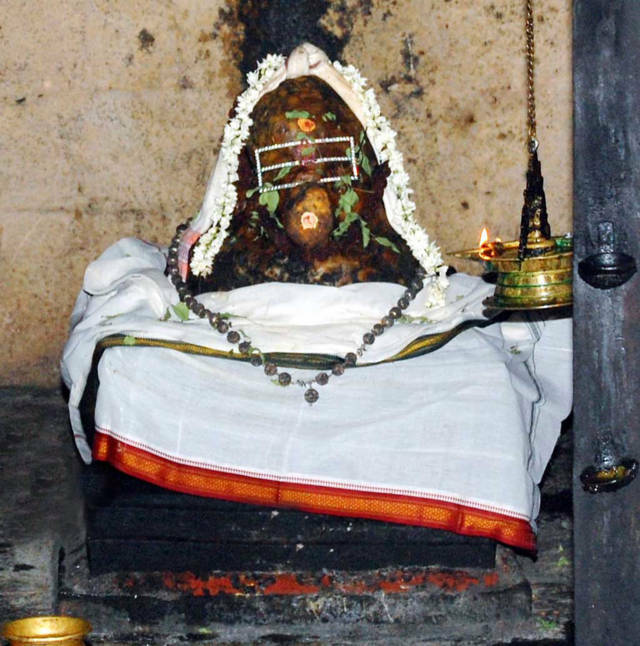 A bronze idol of Sandikeswarar doing Shiva Pooja is available in the temple along with other Urchava idols. Parasuramar worshiped lord Shiva for the sin caused due to killing of his mother. Parasuramar’s sleeping posture idol is available above the Sanctum entrance. In the Tamil month of Panguni 18th day Lord Surya worships Lord Shiva in the form light. 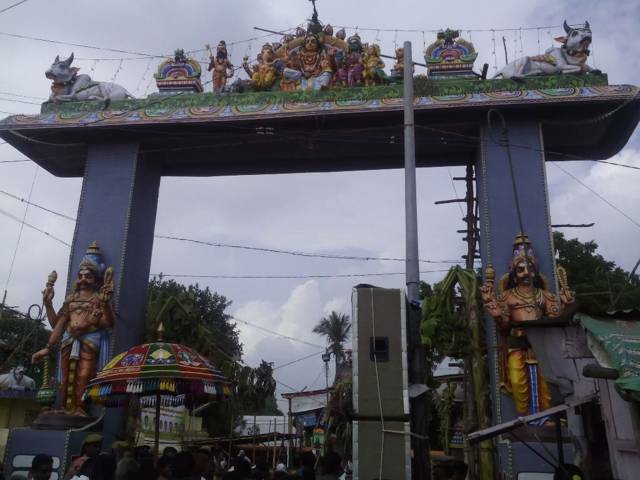 Kalyana Pariharam is done at Kalayana Durgai sannadhi. There is no Navagraha shrine. Moolavar is syambu (Putru – hence there is no abishekam). Tamil inscriptions of 10th to 12th century are found out side Sanctum walls and prakaram walls. 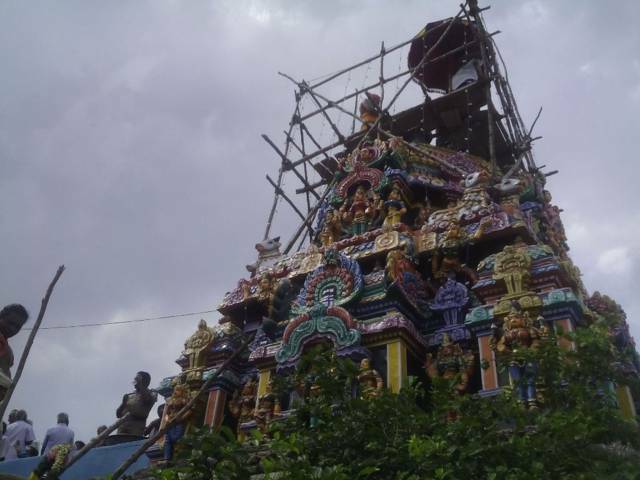 Renovation of the temple was done during the period of Paranthaka Cholan. The tower is of a five tier structure facing east. There are two inner corridors-prakaras. 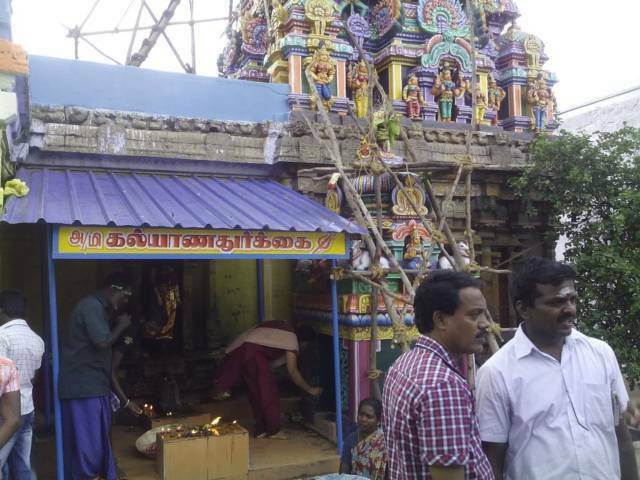 There are shrines for Kamala Ganapathy, Murugan, Panchabudha Lingas, Mahalakshmi, Lingodhbavar, 63 Shiva devotees called Nayanmars, Shiva Durga and Sapthakannikas- 7 maidens. A fragrant oil (Sambirani thailam) is applied on the Shivalinga. As the Shivalinga is too small, a cup is placed upside down to facilitate darshan. Abishek is performed to this cup only. 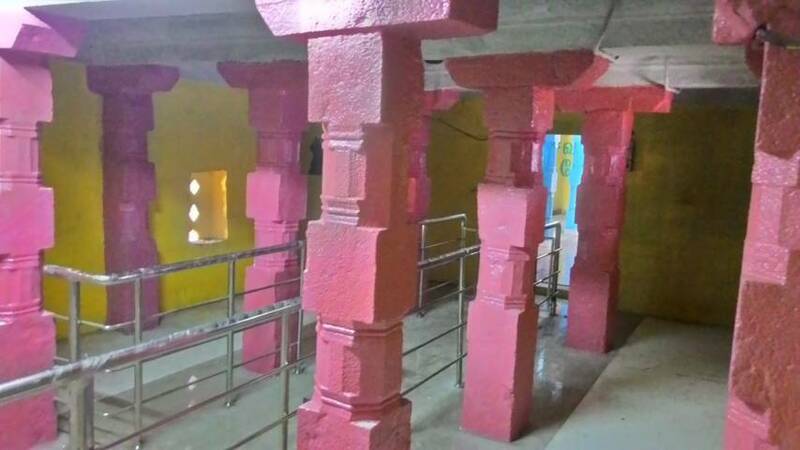 The place is also considered the holy place where sage Parasurama worshiped Lord Shiva to repent for his sin of killing his own mother. The tank he created here is known as Parasurama tank. People pray here for union with their separated life partners and release from serious sins. As a custom, Gajalakshmi may be seen in the west entrance of Shiva temples. In the Alandurayar temple, Parasurama is seen in a lying form. The word Pazhu or Aalamaram in Tamil means Banyan tree and hence the name Alandurayar for Lord Shiva here. The place is known for large number of banyan trees. Hence, the place is known as Tirupazhuvur. In a playful mood, Mother Parvathi covered the eyes of Lord Shiva with her hands. As the eyes of Lord Shiva are Sun and Moon, the world became dark suddenly. The activities of the world came to a standstill. All the sages and Devas were confused not knowing what to do. Lord Shiva told Parvathi that even playful acts, if caused hardship to others, was but a sin and asked her to leave him for earth and perform penance. The Lord also assured that He would come and join Her in the Yogavanam here. Mother Parvathi completed Her penance, made a Linga in sand and worshiped Him standing by one leg. Lord came here and took His consort. This Yogavana is now named Kilapazhuvur. 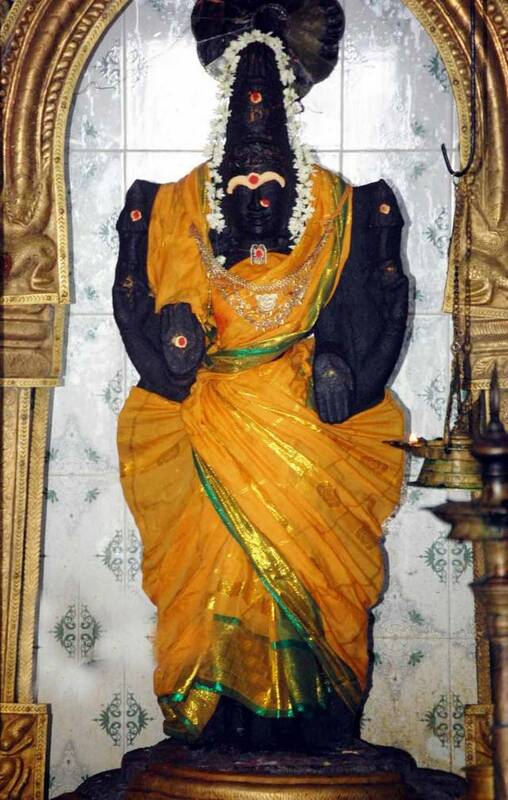 As Mother Parvathi performed Thavam (penance) here, She is called Arundhavanayaki. Location: Located on the Tiruchirapalli - Ariyalur road at Keezhapazhuvur and is about 12 Kms to the south of Ariyalur Town. One can reach this sivasthalam from Tiruvaiyaaru also. Bus facilities are available from Tiruchy, Tiruvaiyaaru and Ariyalur.